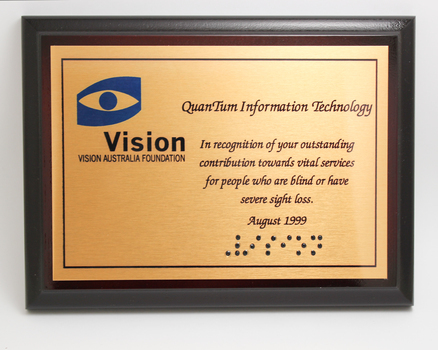 Vision Australia is a leading national provider of blindness and low vision services in Australia. We work in partnership with Australians who are blind or have low vision to help them achieve the possibilities they choose in life. Vision Australia is a not-for-profit organisation with client numbers of 50,000 and we are also a major participant and partner in the international blindness community. We provide services and support for clients through 28 Vision Australia centres in NSW, ACT, Queensland and Victoria. Clinics are also held in 29 other locations and there are outreach services to the Northern Territory and Tasmania. The Vision Australia Heritage collection consists of materials created, produced by or awarded to Vision Australia or its historical organisations that document that history of blindness organisations from the 1860's and their impact upon individuals. It has over 10,000 items including photographs, annual reports, tactile art, building plans and programs. This unique collection contains materials that provide a significant interpretation of changing social attitudes, items created or used by blind or vision impaired individuals, as well as rare pieces that are the only known examples of this type within Australia. Thanks David. We have updated records on both the JMG Stenotype and Pyke-Glauser Braille writer to reflect their wonderful heritage. We would love further details on these items. Can you please send us a message at heritage@visionaustralia.org . 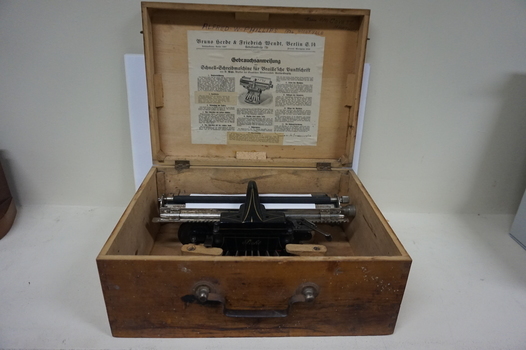 Oscar Picht invented this braille writer in Bromberg, Germany, where he was the Director of the Provincial School for the Blind. Seven keys facilitate the typing of Braille. All in a wooden box with a metal handle on the front and a hook and eye on either. The box looks handmade and was the property of Alfred W Phillips of Ascot Vale in 1934. Picht, the makers' name is painted on the front. 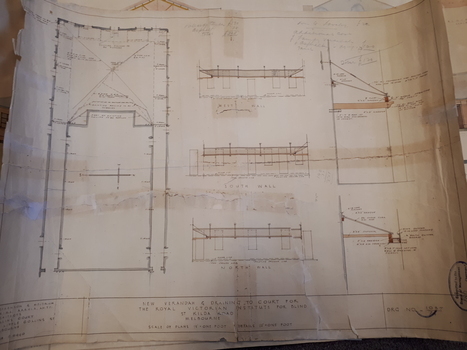 In 1924 plans were submitted to the RVIB board for the addition of a new veranda and associated drainage pipes located in the courtyard behind Ormond Hall. Hand written notes on the plan indicate that the tender for materials from Pollards was 330 pounds, asphalt 35 pounds totally a cost of 365 pounds. And that additional costs of 120 pounds, comprising of 20 for G Lavatory (?) and J Famdy (?) 100 pounds. To promote the work of Vision Australia, ambassadors were created to draw attention to the need for services for the blind and vision impaired. Jess Gallagher is a summer and winter paralympian who is legally blind, runs her own business, and has made various public appearances in her role including this promotional shot on radion 3MMM. Cast iron Brailler. The body of the Braille writer is painted in black with silver and gold painted inscriptions. Seven metal oval keys are situated at the front of the machine. The roller for turning the paper is made from turned wood. 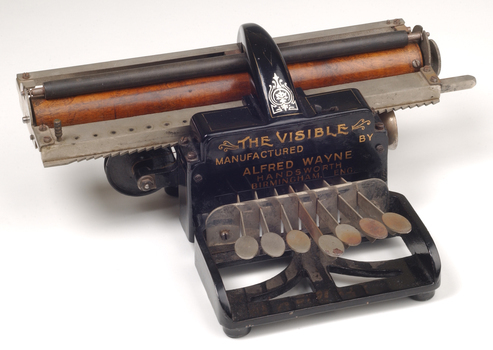 Alfred Wayne & Co. produced a number of braille writers over the years, including The Visible. To keep current with media articles on how vision impaired people, blindness organisations and their activities were reported in the press, books of newspaper cuttings were created. News stories were taken from local, regional and national papers covering a variety subjects. 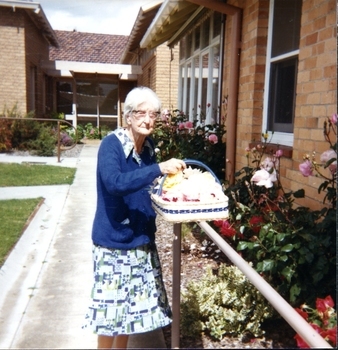 Mrs Camfield, nursing home resident, picking blooms from the garden at Kelaston. A stand magnifier or loupe is a small magnification device used to see small details more closely. Unlike a magnifying glass the loupe doesn't have a handle, but stands on the page to enlarge text or images. 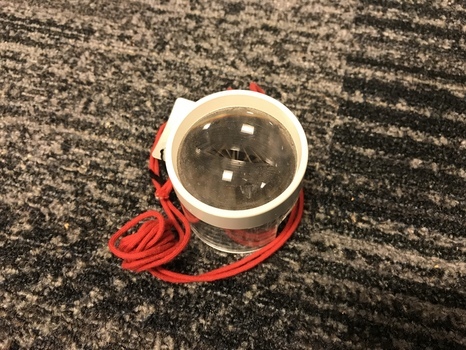 The lens is cylindrical and protected by casing. 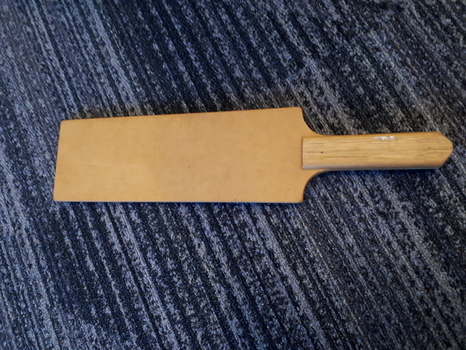 The wooden bat is used to play the game 'Swish' which is a fast, invigorating game, and was developed by blind people in Australia and has been played here for many years. 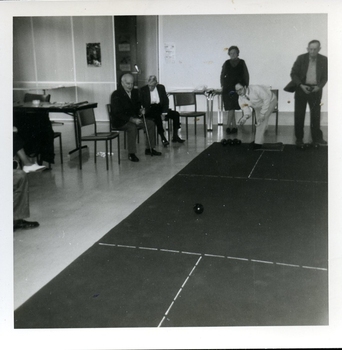 It is played on both a recreational and competitive level; and allows blind, vision impaired and sighted people to compete on almost equal terms. Swish is like table tennis, but instead of hitting a ball over a net, the ball is hit under a net and must travel along the surface of the table. The net is at a height that so that those players with various degrees of sight do not have an advantage over blind players. The ball has bells in it to make it audible and it is about the size of a tennis ball and made of plastic with holes in it. Swish is either played as a doubles or singles competition. The game can be played from one game to the best of five, and the first to eleven or the advantage of 2 after eleven. 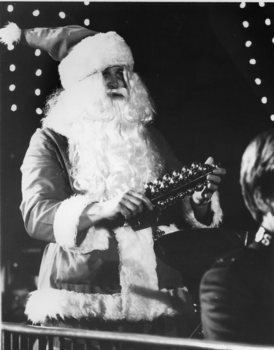 Santa joins the Salvation Army Band on stage at Carols by Candlelight. 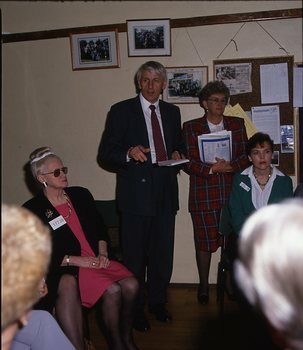 In 1985 the Kelaston Auxiliary celebrated it's 60th anniversary. 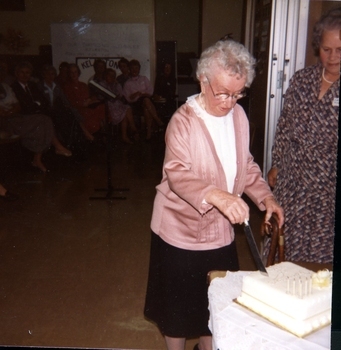 A special event was held at Kelaston, with Mrs Di Jones congratulating Mrs Hamill (the oldest past auxiliary member), who later cut a cake marking the event. 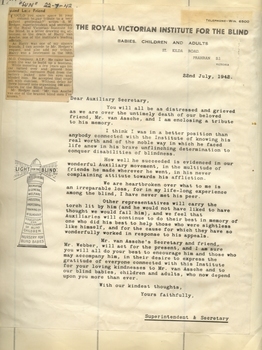 This staff newsletter aimed to keep staff members up to date with what was happening around RVIB, with its often informal manner and chatty style. A Rebel Chronic was produced at times, which consisted of two A3 folded pages. A cartridge designed to be played on the Clarke & Smith MK1 Talking Book player. Each cartridge houses the complete mechanism, track change linkages, replay heads and tape spools, which are stacked on top of each other within the housing. When one track was finished, the user was required to lift the metal cassette, turn it over, and replace it on the turntable. The bulky cartridges were distributed by post or train in strong 'Globite' cases made with reinforced corners and strapped. 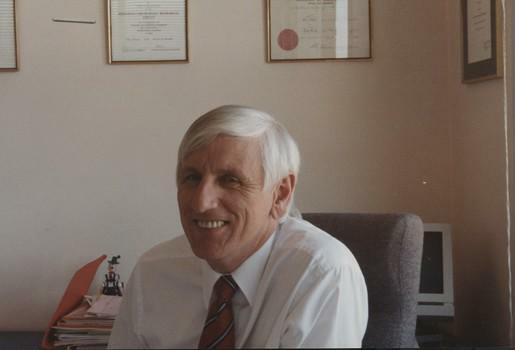 John Cook presents at a function. 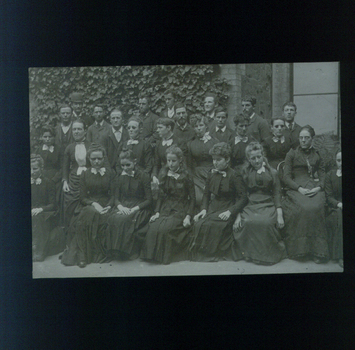 In this undated image, a group of approximately 26 people (mostly female) sit or stand in front of the RVIB building in St Kilda Road. Dressed uniformly but in a variety of poses and expressions, the group pose for the photographer. 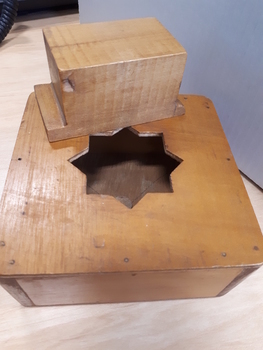 A hollow wooden box with an 8 pointed hole cut in top. A wooden block fits into the hole. The block is rectangular and one end has a straight bar along one side, the other end has two pointed parts on one side. There are no accompanying instructions. 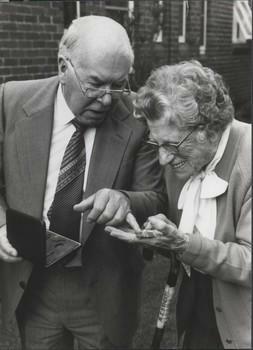 John Wilson shows his Member of the Order of Australia medal to R.J. Stacey (name on the cane that the woman is holding). Playing lawn bowls at Kelaston. This agreement between the Association for Advancement the Blind and J. W. Wilson, Secretary lays out the terms and conditions the hire-purchase of a motor vehicle at 16 pounds per month totalling 1039 pounds. 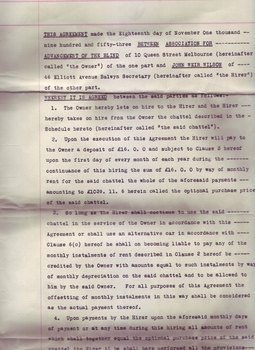 The agreement is Dated 18th November 1953, and is signed and Sealed by members of the General Committee and J. W. Wilson. 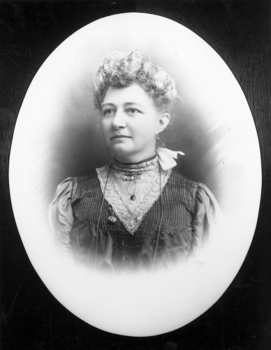 May Harrison was the first librarian for the Victorian Braille Writers Association, as well as it's first Honorary Secretary, one of the first two people taught Braille by Tilly Aston and let the Association use the front room in her St Kilda as the first library. Here transcribers were taught and showed their exercises, as well as blind people visiting to collect or return materials. This lasted for two years, until a larger premises was required, but Mrs Harrison retained the position of librarian and played an active role in the Association until she died in 1912. In tribute to her dedicated work, a Memorial Fund was established and a tablet placed in the Braille Library. 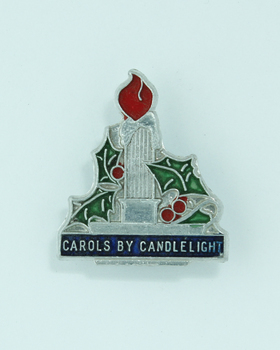 Carols by Candlelight is a Melbourne institution, and these pins were sold to concert goers as a way of raising funds. The pin consists of a silver candle and candlestick with a red flame, surrounded by green holly leaves and red berries. Beneath the candlestick are the words 'Carols by Candlelight' in silver against a blue background. As a way of recognising contributions by agencies and individuals outside of the organisation, commemorate plaques were struck and presented as part of an awards ceremony. 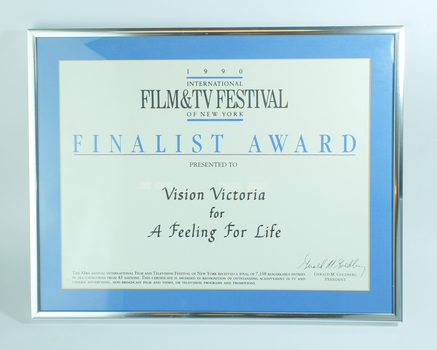 Vision Australia Foundation. QuanTum Information Technology. In recognition of your outstanding contribution towards vital services for people who are blind or have severe sight loss. 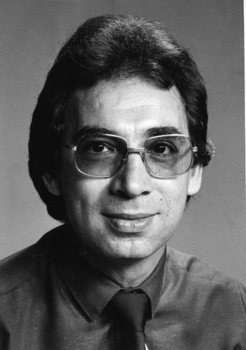 August 1999. 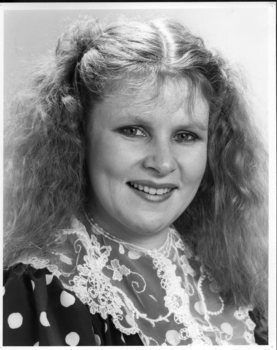 Portrait of Collette Mann, most likely provided by her management for the Carols by Candlelight program. The Sydney Myer Music Bowl comes alight with the 3KZ Carols by Candlelight concert, date unknown. 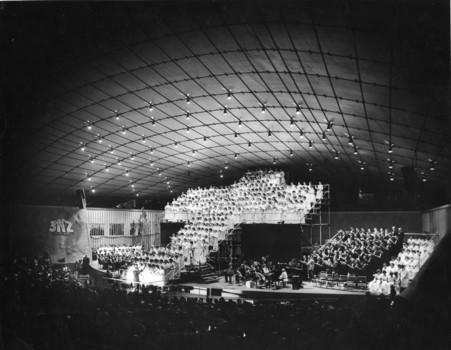 On the stage it musicians and a choir seated in a Calvary Cross arrangement that rises towards the ceiling of the Bowl. 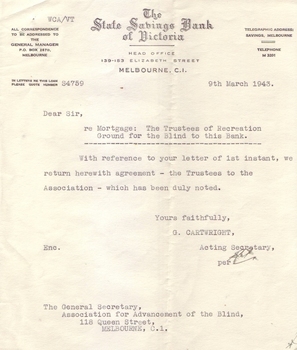 This letter was sent by The State Savings Bank of Victoria to General Secretary for the Association for the Blind, dated 9th March, 1943. It reads "Dear Sir, re: Mortgage: The Trustees of Recreation Ground for the Blind to this Bank. With reference to your letter of 1st instant, we herewith return agreement - the Trustees to the Association - which has been duly noted. Yours faithfully, G. Cartwright, Acting Secretary. 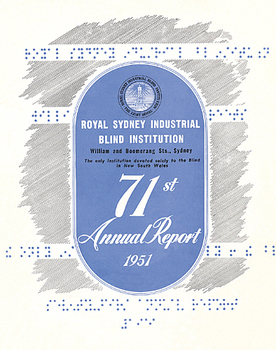 The Sydney Industrial Blind Institute received permission to become the Royal Blind Society of New South Wales in 1952. These annual reports chronicle the work of the society until it's amalgamation with two other state based agencies to become Vision Australia in 2005. A group of ladies site around a table, rubbing make up products into their face. 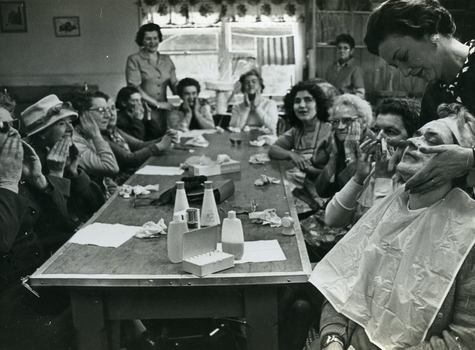 One lady, in the foreground, is receiving a facial massage.